Bazelgeuse is an invading monster in High Rank hunts and Expeditions, being ubiquitous to the point of being in potentially every single hunt as a constant, powerful annoyance. Its everlasting presence and extremely aggressive nature will have it always interrupt hunts, requiring any hunter who is aiming to hunt within High Rank to be properly prepared and equipped for it. However, one popular method of repelling it is using Dung Pods, but there are several unlisted gameplay mechanics that makes this option much more complicated and much less effective regarding Bazelgeuse compared to any other monster. Causing Bazelgeuse to retreat via Dung Pods will not keep it away from the zone for long (sometimes being as little as a minute). This is due to Dung Pods forcing a movement to a different zone, but not keeping a monster in that zone when they normally should upon moving there. This is because Dung Pods do not reset zone transition damage thresholds of monster, like dealing damage is scripted to do throughout a hunt (this is why a hunter can use dung pods to move monsters through multiple map zones one after another until they reach the one that is desired to hunt in). 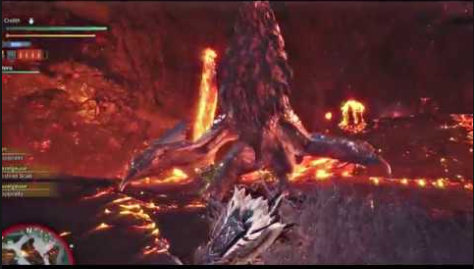 As a consequence Bazelgeuse will immediately begin to return to where the hunter(s) caused it to retreat from the moment it reaches the other zone. Bazelgeuse's reason for such a quick return is due to it being attracted to other monster roars. 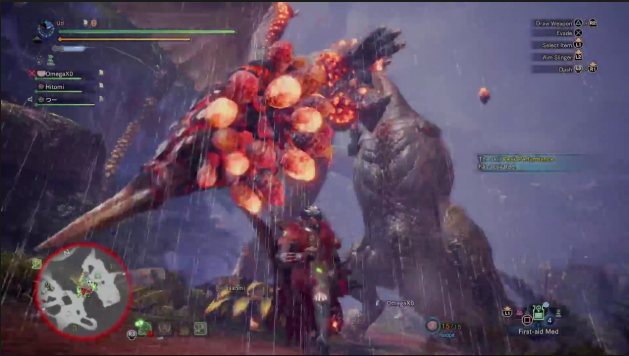 Considering that all monsters roar constantly, it causes Bazelgeuse's scripted behavior to break common Dung Pod related behaviors in favor of flying back to the battle where it was repelled, where a hunter will no doubt be hunting another monster. if the hunter(s) can handle fighting Bazelgeuse with another monster present, resulting in a complicated three-way battle which will include two sources of roars which will each stun hunter(s) without sufficient levels of Earplugs. if the hunter can use Bazelgeuse’s dropped scales to inflict damage and stagger onto other monsters efficiently, providing that the scales are avoided since they are harmful to hunters. One may also want to hold onto Dung Pods and only use them during gravely inopportune times, rather than immediately upon encountering Bazelgeuse. This is due to Bazelgeuse being hostile to everything, hunters and other monster alike, meaning that it will fight anything in the vicinity, which can potentially be used as a second damage source and aggro diversion target. In the event of the second invading monster, Deviljho (including the Tempered variant), Bazelgeuse can be lured to the sight and will engage in a turf war that can result in thousands of free damage dealt, drastically aiding in a hunt more than hindering it. And as a bonus, Bazelgeuse will immediately retreat, not having to fight it alongside Deviljho (see Advanced Tips ). Do note however that Bazelgeuse's presence makes battles considerably less predictable, so using a Dung Pod to repel it may suffice just to eliminate any added randomness which may be more valuable than Bazelguese's benefits depending on the hunter's chosen weapon and play style. If one chooses to keep Bazelgeuse instead of repelling it, however, it can potentially warrant abusing Bazelgeuse as a dangerous, pseudo-ally. However, if a hunter is desiring to fully use these advantages they should be prepared to equip themselves appropriately. One should consider enough equipment and decorations to achieve level 5 Earplugs, due to monster roars stunning hunters and Bazelgeuse's roar is a level 5 roar, meaning that Earplugs at levels 1-4 will be useless. Bazelgeuse also constantly roars, stunning an unprepared hunter several times during a hunt for any other monster(s) to freely attack, which can in itself be much more detrimental than all of the aforementioned possible upsides of keeping Bazelgeuse around if the hunter is unlucky, has inadequately upgraded armor, or is participating in a high level or Tempered monster hunt where taking any unnecessary damage is devastating. Pieces of the Bazel set can easily provide 4-5 levels of Earplugs without decorations to remove this roar risk if a hunter so chooses. Another alternative, albeit temporary, solution is to don the Rocksteady Mantle during moments when Bazelguese arrives, although this will only be active for 60 seconds and the cooldown afterwards will leave hunters vulnerable to Bazelguese's roars stunning them again without the proper gear. If a hunter does not want to specialize this heavily specifically to deal with Bazelgeuse when there are several other monsters to hunt and finds the above advantages to not be worth the price, however, using Dung Pods is a warranted option. However, dedicating oneself to repelling Bazelgeuse with Dung Pods will require a large quantity due to how quickly Bazelgeuse returns to the battle, making repelling it with this method extremely resource expensive. Possibly much more so to the point of being more cumbersome than equipping and utilizing the aforementioned gear and strategies, depending on the skill and equipment of the hunter. Very helpful page. I wonder if Baz&apos;s AI "breaks," though. Its design seems intentional. A happy accident, maybe!